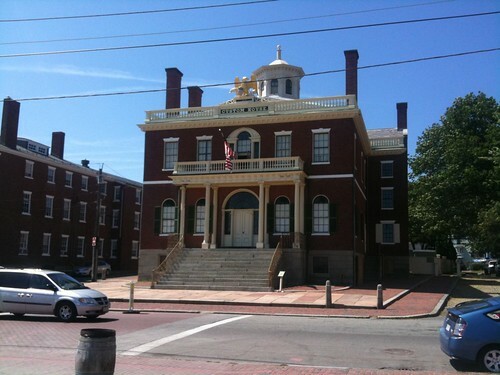 From the Salem Visitor's Center, we learned that Salem is not just the home of witch trials, but also the home of Nathaniel Hawthorne. The witches get much more of the advertising, though - which is probably just as well, because it would be hard to make a recognizable caricature of Nathaniel Hawthorne to decorate an ice cream stand. 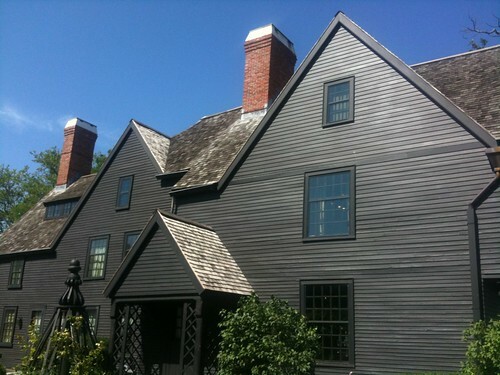 The House of Seven Gables (the setting for the Hawthorne novel of the same name) sounded interesting, and I was in a strong mood of "Don't plan ahead. Pick an interesting thing, do it, repeat." So we went to the House of Seven Gables. It was an interesting tour. 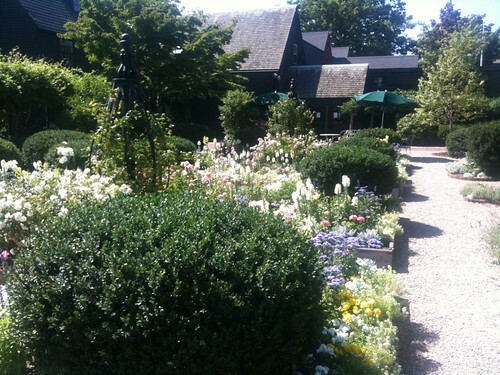 (No photographs inside the House of Seven Gables, because they weren't allowed.) The house was a mansion, but it had grown progressively from a much smaller house, and it showed several different styles from its development. • A secret staircase was added to support one scene in the novel where a character appears in the living room by surprise. • A cent-shop was added in a front room because one of the characters in the novel ran such a shop, though there had never been a shop in the house. • Even the seven gables were a reconstruction-to-novel. There had been seven gables on the house, but I believe there had not been seven gables all at once, and I know that there were only five gables on the house at the time Hawthorne was familiar with it. The tour included one of the best visual aids I've met: they had a model of the house made of several blocks, so the docent was able to say "The house started as this small block. Then (adds block) they added this addition onto it. Then they removed these gables..." It was really well done. The tour also included a tour of Hawthorne's birth house. 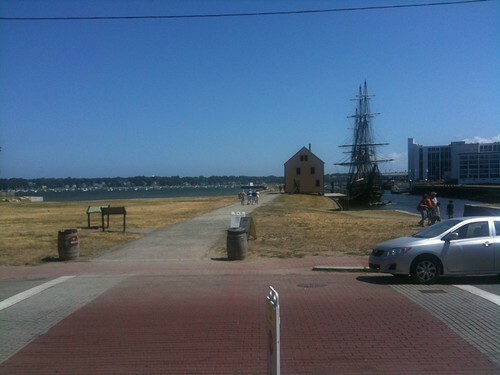 It was not in its original location; a church had wanted the original site of the house for a parking lot, so had sold the house to the House of Seven Gables organization for one dollar - buyer pays for delivery. It was definitely a much more modest house than the House of Seven Gables, which underscored that the House of Seven Gables really was a mansion. 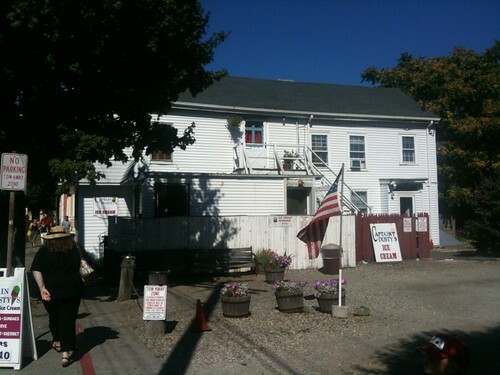 Across the street from the House of Seven Gables was Ye Olde Pepper Candy Companie, a candy store. I'm usually suspicious of anything called "Olde", but this place seems to have some legitimate claim: they say that they're the oldest candy company in the United States, dating back to 1806. Their candy specialty is Gibralters, large diamond-shaped lozenges (about the size of a business card) with about the firmness of an after-dinner mint. They were reasonably tasty, but I won't be responsible for bringing them back into fashion. It was yet another hot and humid day, so we stopped for ice cream at Captain Dusty's. This wasn't Roadfood-listed (or mentioned in the Roadfood Best Ice Cream in New England), and it's probably fair that it's not - or maybe I adjusted my experience to match my expectations. I had a raspberry lime freeze, which was pretty good but too sweet for my taste; Lori had a scoop of bobcat ice cream, which turned out to be butterscotch with chocolate chips. 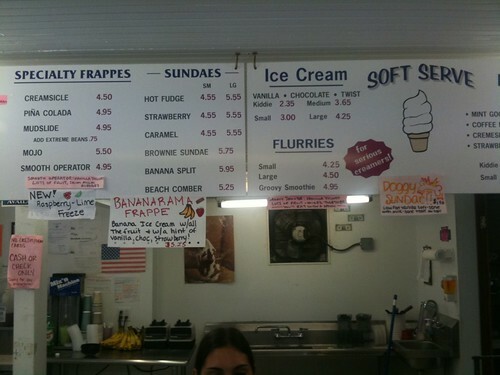 I'm probably being too harsh on Captain Dusty's, because it did have some definite individual character - check out the Doggy Sundae on the menu board.